Our promotional brochures are designed to be edited easily to fit your center's needs. Just give us your address, phone number, and hours and we will send you a proof! But, you can do more! If you see something in the brochure that doesn't match what you want to portray, just let us know how to fix it and the brochure will be perfectly tailored to your center. Any Tri-Fold Brochure - You Choose! Have you ever wished you could have 1 of our hundreds of brochures with your own information on it? Maybe your logo, address, operating hours, or even a map? Maybe the brochure was great except a few small things you would love to change. Now you can by simply ordering any of or tri-fold brochures custom. Or, if you just want your own brochure with all your own information, just give us a call and we will get you started with a great brochure at a great price. Written to be the fundraising companion to the "Abortion Vulnerable Brochure" below, this brochure will give your potential donors a reason to donate. It includes what you do, why you do it, and who you reach. And, at the end of it all, it gives them the opportuntity to start supporting your work. Our new abortion vulnerable brochure is written just for PRCs to bring abortion vulnerable clients to your center. Using neutral text with an emphasis on care and services, these brochures can be placed in key areas around your community and given to existing clients to give to their peers. Each brochure can be fully customized including your own text, your contact information, and even a map to your center! Plus, customization is simple - just place the order and we will quickly create a proof for your approval. 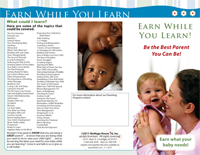 This brochure is an excellent tool for promoting the Earn While You Learn Program and can be customized for your needs. It gives a great description of what clients can learn and do for themselves and their babies. It will help promote community awareness about the program and can also serve as an informative brochure for prospective donors. Size is 3 1/2" x 8 1/2" tri-fold. This custom EWYL is the same as the brochure above but translated in Spanish to reach that underserved community. Prices include full customization and any changes you need.